For central heating systems with a store of hot water in a cylinder installing a Greenskies Solar water heating system from Worcester means that significant savings can be made on water heating bills. Greenskies Solar water heating can supply 50-70% of the hot water used every year. The remaining portion of hot water demand will be provided by the central heating boiler in the normal way. 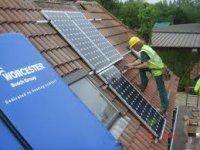 Installing Worcester Greenskies solar panels provides immediate savings on fuel bills and major benefits to the enviroment. Here at NC Jones Plumbing & Heating Services we install Thermal Solar Panels that can offer 30-50% savings on peoples yearly hot water bills. Thermal Solar Energy is the new cost efficient energy source. Beautifully integrated and made of high quality materials, quality solar panels will add value to your property too. Using solar power you will be less dependent on gas supply and the rising fuel prices. NC Jones Plumbing & Heating Services are a company with experience and trained members of staff on hand to help and advise you where possible. Our clients recommend our services highly due to our reliability and professionalism. We only provide high quality workmanship at all times, so you can be sure you are getting the best possible service. All of our rates are highly competitive, providing and installing solar panels for you.